If you live in London then you’ll be familiar with wooden sash windows.My Mum is lucky enough to have orginal sash windows however they are looking a little worse for wear and she is really hoping they don’t need to be replaced. The quotes she has got have ranged from £300 per window to simply overhaul and draught proof them, (fixing the patches of rot was additional), all the way to a £3500 for a brand new double glazed hardwood sash window. 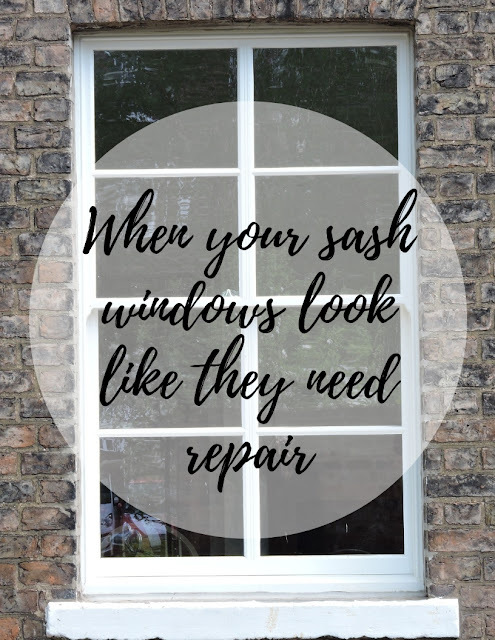 We had mixed feedback from the companies I invited round, many suggested entirely replacing my original sash windows, it’s not worth the hassle of repairing and they’ll most likely need to be repaired again in another five years time. Other companies quite rightly pointed out that wooden sash windows will always require maintenance and repair but have already lasted a hundred years and there’s no reason they won’t keep on going with a little TLC (a lick of paint every five years or so). This to me seemed logical, I didn’t want her bias swayed by the fact it’s considerably cheaper and all companies that quoted were clear; sash window draught proofing has an extremely positive effect on the overall temperature. That’s good then because when it’s windy her sash windows rattle and cold air floods in, stopping me from ever building any kind of consistent temperature. This is also well documented by this government draught proofing factsheet. They mention draught proofing a window will save between £25-£35 per window. So assuming sash window repair is feasible as this London sash window company suggests, it seemed pretty obvious to me that restoration and draught proofing was a far more sensible option than entire replace. We have no reason to doubt them, their reviews online are outstanding. Not just because new hardwood double glazed sash windows are outrageously expensive, but also, it seems rather sympathetic to a building that’s been standing a hundred years or more. So my Mum had the final quotes in, the average cost for sash window repair and draught proofing was around £500 per window, where entire replacement averaged £3000.00. This is pretty much the average price in London I’m told. To my mind the only significant benefit of new double glazed sash windows would be the improved acoustic performance over single glazing. If the heat issue is resolved with draught proofing then it seems less of a concern. I know that she is not overly worried about the noise so much, this is my childhood home and we have put up with it for years. One London company offered an alternative solution which wasn’t really appealing to me but worth a mention, they said they could install double glazing into the original frames. The cost for this process was around £1100 per sash window which seemed far more affordable than brand new double glazed sash windows but still, a lot of money and I don’t think the reduced noise warrants the additional investment. It was quite a pleasant experience being quoted by all companies, they all operated in London. I know she will have the sash windows repaired, draught proofed, and then decorated in the summer. Now we just need to decide which sash window company to use. It’s not always advisable to go with the cheapest quote, but the one you believe you felt most comfortable with and who will do an honest, quality job.